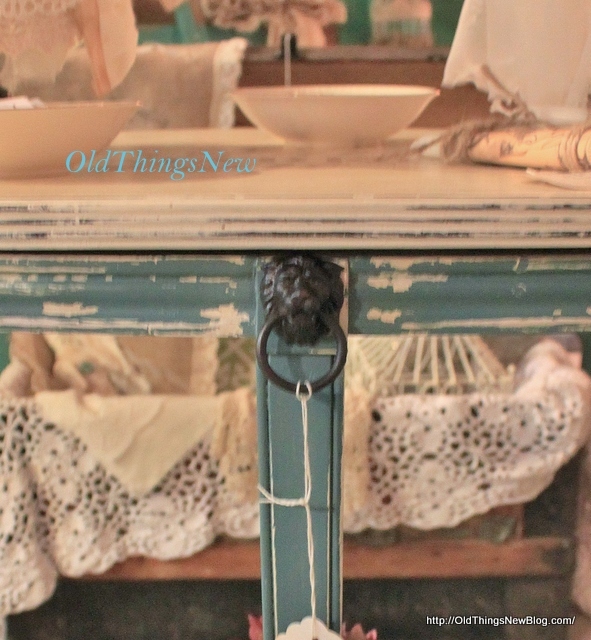 Miss Mustard Seed Milk Paint and a Funeral Parlor Table! I am so excited to share with you my first experience using Miss Mustard Seed (MMS) Milk Paint. 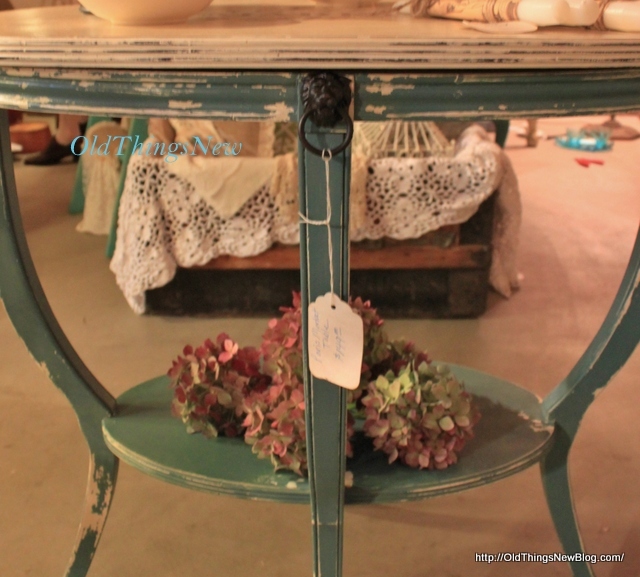 Though I’ve been painting with Annie Sloan Chalk Paint (ASCP) and my Homemade Chalk Paint for quite awhile now I had never tried MMS until this past summer. It wasn’t that I didn’t want to try it but just that it wasn’t available in a shop anywhere near my home. So a couple of months ago when I went online . . . ONCE AGAIN . . . to see where MMS Milk Paint was available, and when I found it in a city less than twenty miles away, I hit the road! This is the little side table that I wanted to try this fantastic new paint on. A friend picked it up from the junk pile at a funeral parlor. Can you believe they were going to throw this away? It was in really good shape and the color was okay but I really, really, really wanted to try MMS’s Kitchen Scale. That’s the name of a color in case you were wondering. THIS is Kitchen Scale . . . beautiful color doncha’ think? Now while the color is amazing the most wonderful thing about MMS milk paint is that you NEVER KNOW how your painted piece is going to turn out. It is always a surprise and . . . YES . . . I love surprises! So I painted it on and waited as patiently as I could to see what would happen. Would it grab all the paint color and remain this beautiful clear blue color or would it do that funny thing that thing it is sometimes known to do, and begin to bubble and peel? Fortunately the paint began to bubble in several places. I say “fortunately” because that is exactly what I was hoping for! Several places became chippy as you can see by the picture above, exposing the white paint beneath the blue. I LOVE this about this paint! Once the first coat was dry I painted a second coat which caused a little more of the bubbling effect. Then I took a scraper to the chippy places and gently scraped off the excess paint, lightly sanded the chipped edges and then sealed it all with soft wax, which stops the chipping process. I love chippy furniture and with this paint there is no need to figure out where to use the sanding block to get the best distressed look. The paint does it for you. The table top wasn’t a beautifully grained piece of wood so I decided to paint it with ASCP Old White and then applied a graphic that I purchased online using my favorite METHOD for transferring typography onto wood. I finished it off with clear wax with just a dab of dark wax added. I did use my sanding sponge on the top to distress the edges. One final thing I added was the lion’s head pulls that I found at a local antique store. They were all slightly different colors so I spray painted them with Rustoleum’s Oil Rubbed Bronze spray paint. 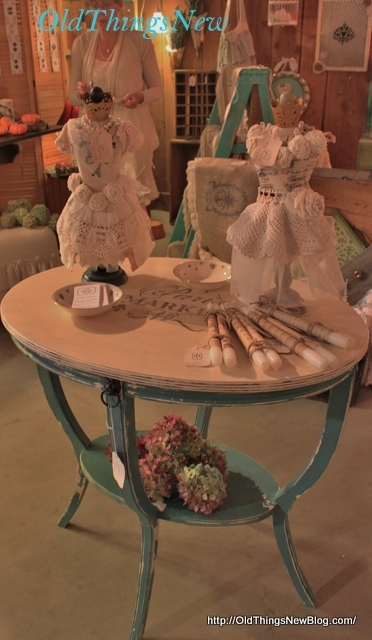 I took this Funeral Parlor Table turned Sweet Frenchy Table to the Queen Bee French Flea Market last month and she sold right away. I was a wee bit sad but I didn’t really have room for any more furniture in my own home! This is a color I use in my home a LOT though so I may be repainting something I already have in the near future. Who knows, Mr. OTN may come home to another surprise. I think he loves surprises too! P.S. In case you were wondering, Marion (Miss Mustard Seed) is not paying me to write about her paint line. 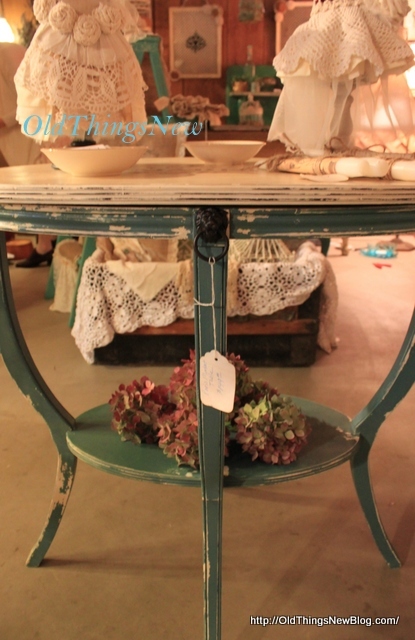 This post simply reflects my pure unadulterated love of MMS Milk Paint! Great looking table, Patti! Love the colors you chose. The image looks great, too. I went back and re-read your link about your transfer method. This might be something that will work for a project I have in mind to work on next week. I am horrible at free hand painting and I want to make a sign. I could do vinyl but I think I want to distress a little bit and paint would be the better medium for the lettering. Oh my gosh Patti, I love it! I can NOT believe they were throwing that beauty away. I too have wanted to try this paint. I don’t know anywhere close that sales it. Guess I need to go on line. Thanks for sharing it with SYC. I would love to be able to refer to a piece of my home furnishings as my funeral parlour table. 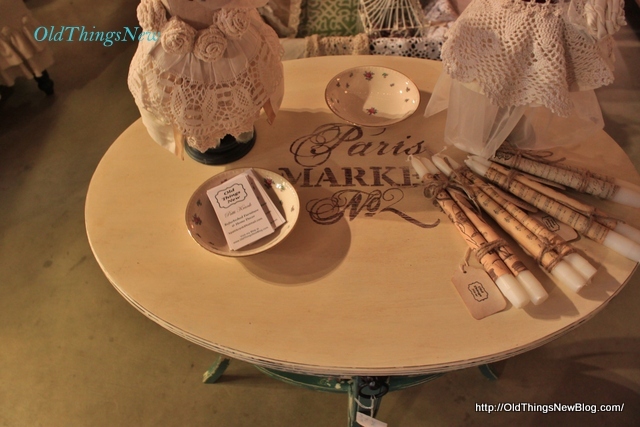 You did an awesome job on this table – so pretty! Lov’n the graphic on the top too. MMS is fun to paint with and she has so many great colors to choose from. I found you over at the Make It Pretty Monday party. I love how the table turned out. 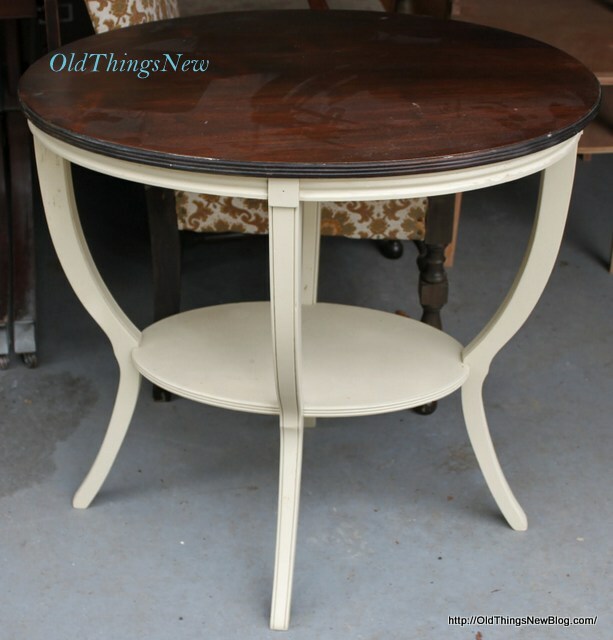 Milk paint seems to give a more natural “old” look. Great color too! I can’t believe they were throwing that table out! We’d probably be shocked if we knew of all the things in the dump that we could have made beautiful! Visiting from Someday Crafts. I am very sincere when I say this is one of the prettiest transformations I have seen. I would have grabbed that baby up too if I had the chance to bring it home after your beautiful touches. And speaking of touches, the lion’s head was a fantastic touch to add. Love your work! I love, love, love that color and am so glad to see you embraced and utilized the chipping – it looks fabulous. I recently painted a wicker plant table with MMS Tricycle and it chipped…not what I was looking for on this particular piece so I was worried I had done something wrong. Glad to know it wasn’t me…just the wrong piece to use this type of paint on. 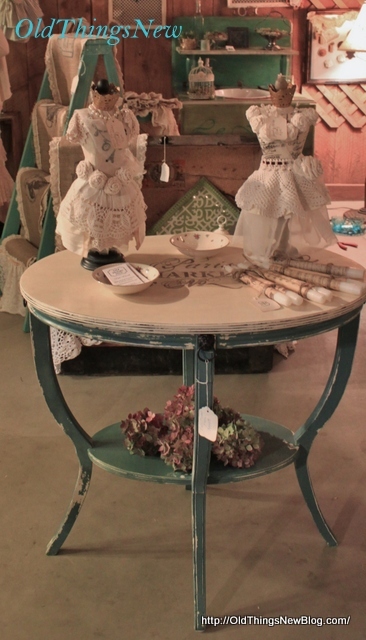 Love this table, Patti! 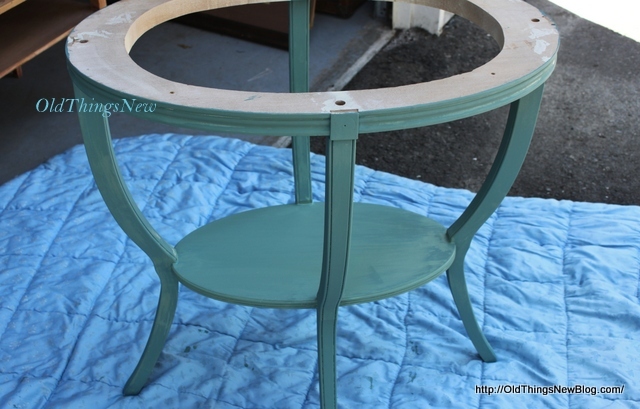 Great milk paint color and it turned out great! Thanks SO much for sharing at the Frugal Crafty Home Blog Hop. Have a Great Weekend! Really like the color. great project! Make have to try the paint you used looks like it saves some steps. What a great table and I love the color! Thanx for joining THT! Your table turned out fabulous. I just purchased some MMS Paint as it was FINALLY available in our State and better yet, from a Dealer in the Antique Mall where I have my Showrooms! Haven’t used it yet, but from your critique I can hardly wait now, since I too LOVE Surprises and for the paint to do a lot of the ‘work’ of distressing a piece all by itself! Not that I’m lazy mind you, but ‘natural’ distressing, by whatever form, just always looks more authentic and less contrived to me.